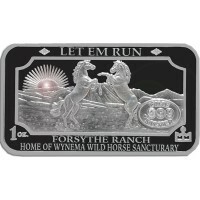 In Honor to Preserve the Historic Wild Mustangs in a Healthy, Happy, Enviroment, the Marshall Mint has produced the "Let Em Run" Commemorative Series to Raise Funds and Awareness to our Beautiful and Free Wild Mustangs. 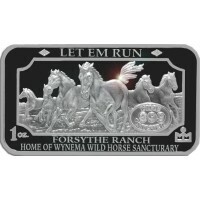 These 1 oz .999 Fine Silver Ingots are a Limited Edition, Double Struck and are only available at the Marshall Mint. 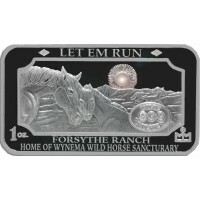 1 oz Silver Ingot~""Fighting For Love"
1 oz .999 Fine Silver Depicts Wild Mustang Stallions Protecting It's Family &..
1 oz .999 Silver Ingot~"A Mother's Love"
1 oz .999 Fine Silver Ingot depicts a Mare and its Foal ..
1 oz .999 Silver Ingot~"Let Em Run"
1 oz .999 Fine Silver Ingot depicts the Wild Mustangs Running Free. ..
3- 1 oz .999 Fine Silver Ingot Set ..